4-6-0 MIXED TRAFFIC ENGINE at Cambridge, LNER, hauling one of the special “tourist trains” introduced a short time ago for excursion traffic. Cars are painted green and white. Engines of this type were built by the Great Central Railway for secondary passenger and express freight service. IN the chapter “British Express Locomotives”, which begins on page 1464, we have seen that British express passenger trains have been worked in past decades, taking a general average, with smaller locomotives than those of other countries. In freight and short-distance train working the same conditions have largely developed. As with the express engines, the high calorific value and good quality of British fuel have made it possible to design locomotives with relatively small fireboxes, thus limiting the size and weight of the engine as a whole. But this is not all. Freight train operation in Great Britain has been built up on the basis of small consignments and frequent service, rather than the larger consignments and lengthy hauls of, say, the North American continent. Not only so; but the failure of Great Britain to equip its wagon stock universally with the continuous brake has set a limit to the length of train that can be worked under adequate braking control. It has also limited freight train speeds. This explains the preference in Great Britain for trains averaging in length some sixty or seventy wagons and a brake, weighing with their loads from 1,000 to 1,200 tons or so behind the tender, and, in general, travelling relatively slowly. For the working of such services eight-coupled wheels provide ample adhesion, and on the three British railways responsible for the major part of Great Britain’s freight services, the heavy main-line work is thus performed chiefly by 0-8-0 and 2-8-0 locomotives. The LNER once went to the length of building two 2-8-2, or “Mikado” engines, for heavy freight service, carrying boilers uniform with those of the passenger “Pacifics”; but these locomotives proved, in effect, to be too powerful for their work. They bear the numbers 2393 and 2394. With the sole exception of the 2-8-0 + 0-8-2 LNER “Garratt” articulated locomotive used for banking on the 1 in 40 gradient between Barnsley and Penistone (Yorks), Nos. 2393 and 2394 are the most powerful freight locomotives in Britain. They have boilers containing 2,930 sq ft of evaporative heating surface, and 525 sq ft of super-heating surface; the firegrate area is 41¼ sq ft; driving wheels are of 5 ft 2-in diameter; and the working pressure is 180 lb per sq in. The tractive effort provided by the three principal cylinders at 85 per cent working pressure is 38,500 lb. But the trailing pair of wheels under the firebox of No. 2393, 3 ft 8-in diameter, is provided with “booster” gear, consisting of two 10-in by 12-in cylinders, which can increase the starting effort up to 47,000 lb. No. 2393 weighs 100 tons in running order, and with tender 151½ tons. These two powerful locomotives work coal trains of a hundred wagons, with a total weight behind the tender of 1,600 tons, from Peterborough to London, in specially arranged paths, and return with “empties”. It is the problem of “stowing” trains of this length in sidings and elsewhere, when they have to be passed by faster moving traffic, that makes for difficulty in operation, and explains why no further freight 2-8-2’s have been built by the LNER. The 2-8-0 engines can comfortably meet all existing demands. 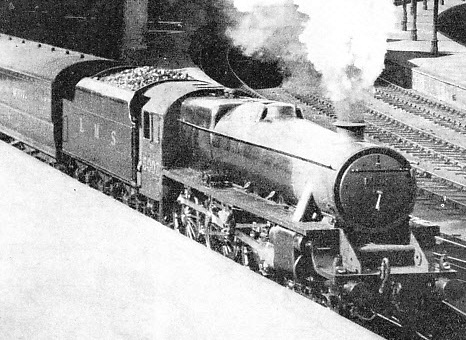 2-8-0 TWO-CYLINDER HEAVY GOODS ENGINE introduced on the LMS in 1935. The chief dimensions of this locomotive are: cylinders 18½-in by 28 in, coupled wheels 4 ft 8½-in diameter, total heating surface, including superheater, 1,698 sq ft, grate area 27.8 sq ft, and steam pressure 225 lb per sq in. But if the equipment of wagon stock with the continuous brake were to become more general, and the movement of freight as a whole, coal and minerals included, were to be correspondingly speeded up, then such types as the 2-8-2 would come into their own. Such acceleration of freight working may become imperative later on, if the speed of passenger trains continues to increase. A slow-moving freight train occupies an inordinate share of the running lines in the course of its leisurely progress, and lines congested with freight trains are the most difficult of all over which to arrange high-speed passenger paths. But the introduction of continuously braked freight stock into Great Britain is steadily proceeding, and many express freight trains, with vacuum brake equipment from end to end, are now operating over British main lines at speeds not far short of the express passenger workings. The LNER, for example, has express freight trains which are permitted to load up to sixty wagons and a brake. If made up to the full permissible length, they average in weight, with traffic of the general description that is consigned by such services, some 650 or 750 tons behind the tender. These trains are timed over favourable stretches of line at over fifty miles an hour between passing points. It is for the working of traffic of this description that the various “mixed traffic” types of locomotive in Great Britain have been introduced. Their principal characteristic is a size of driving wheel midway between the 6 ft 6-in or 6 ft 8-in of the express passenger engine and the 4 ft 6-in or 5 ft of the freight engine proper. This gives a mean figure of about 5 ft 8-in to 6 ft, which is large enough, with modern valve arrangements, to permit of high speeds if the engines are used on passenger work, but small enough, on the other hand, to give a high tractive effort in freight working. MIXED TRAFFIC ENGINE in service on the LNER. This “Mogul” (2-6-0) locomotive has the following principal dimensions: three cylinders 18½-in by 26-in, driving wheels 5 ft 8-in diameter, total heating surface, including superheater, 2,308 sq ft, grate area 28 sq ft, and boiler pressure 180 lb per sq in. The weight of engine and tender in working order is 122¼ tons. The “Mogul”, or 2-6-0 wheel arrangement, was first popularized for this purpose, and many hundreds of such locomotives have been built by the LNE, LMS, Great Western, and Southern Railways. From this the GWR, after a successful experiment with 4-6-0 engine No. 4900 “Saint Martin” - which was rebuilt with driving wheels of 6 ft instead of 6 ft 8½-in in diameter - developed its now numerous “Hall” class of 4-6-0 locomotive, with 6 ft wheels. They compare with the “Moguls”, which have driving wheels of 5 ft 8-in diameter. Similarly, Mr. W. A. Stanier, after becoming Chief Mechanical Engineer of the LMS, abandoned the building of “Moguls” in favour of the new and highly popular two-cylinder “general purpose” 4-6-0’s that he has now introduced. Over the heavy grades of the Midland Division these have quickly proved themselves to be ideal engines for express passenger work, capable of maximum speeds of eighty-five miles and hour and upwards when necessary, despite their relatively small wheels. The far steeper grades of the Highlands suit them equally well, for here the added tractive effort of their smaller driving wheels is of immense advantage in climbing the steep banks. The LNER, on the other hand, has remained faithful to the 2-6-0, or “Mogul” wheel arrangement for mixed traffic service. The first of these engines, designed by Mr. H. N. Gresley, was introduced in Great Northern days and was the two-cylinder series now classified as “K.1” and “K.2”. Then there emerged from Doncaster Works the first of the “K.3” type, distinguished by having three cylinders and boilers of no less than 6 ft diameter. ONE OF THE LARGEST FREIGHT LOCOMOTIVES in Great Britain, No. 2393 of the LNER, has a boiler with 2,930 sq ft of heating surface and 525 sq ft of superheating surface. The driving wheels have a diameter of 5 ft 2-in and the working pressure is 180 lb. This engine is provided with “booster” gear which can bring the tractive effort at starting up to 47,000 lb. Engine and tender weigh in working order 151½ tons. They were originally numbered 1000 to 1009, and have now become Nos. 4000 to 4009, since when many others have been built. These engines work all the express freight services between London and York. including some notable trains such as the night “Scottish Goods” from King’s Cross goods station to Glasgow. Notwithstanding driving wheels of only 5 ft 8-in in diameter, these locomotives have been timed on passenger trains at maximum speeds as high as seventy-nine miles an hour. The Great Western “Moguls” have driving wheels of the same diameter, and the best speed effort with which they have been credited was made during the tests of the Bridge Stress Committee, when one of them, running light, is reputed to have touched eighty-seven miles an hour. But such speeds as these are obviously not the primary aim of a mixed traffic design, which is intended, as previously indicated, to be a “maid-of-all-work” suitable for many different descriptions of traffic. On the Southern Railway the “Moguls,” by contrast, have been used almost exclusively, up till now, on passenger services, particularly between Victoria and Eastbourne and between Waterloo and Portsmouth. But the electrification of the former route, and the introduction, since the recent accelerations, of the powerful “Schools” class 4-4-0’s over the latter, have displaced the “Moguls,” which will now probably figure more extensively than before in freight working. The London and South Western Railway, now the Western Section of the Southern Railway, was, however, one of the first British companies to develop the use of small-wheeled 4-6-0 locomotives for express freight service. It now has an efficient stud of what might be termed “Junior King Arthurs” at work on fast freight services between Nine Elms and Southampton Docks, and between Nine Elms and the West of England. These engines are similar in every way to the express engines except that they have driving wheels of 5 ft 7-in diameter in place of 6 ft 7-in. They take their turns, as may be necessary, on passenger trains, and especially on the boat trains between Waterloo and Southampton. MODERN 4-6-0 LMS LOCOMOTIVE for mixed traffic. This engine, one of a large class, has the following dimensions: cylinders 18½-in by 28-in, diameter of coupled wheels 6 ft, total heating surface, including superheater, 1,844 sq ft, grate area 27.8 sq ft, and boiler pressure 225 lb per sq in The weight of engine and tender in working order is 126 tons. Predominant among freight locomotive types in Great Britain is the 0-6-0, of which many thousands are in use. 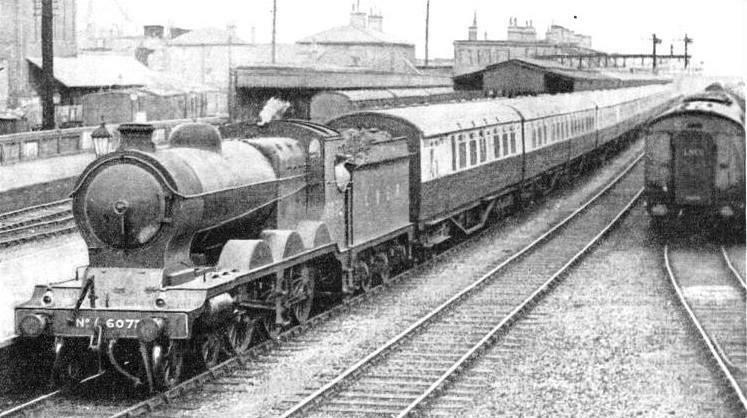 The most multiplied single class is the standard Class 4 0-6-0 of the LMS, which may be found at work all over that system. These engines are typical of modern 0-6-0 tender freight designs with 20-in by 26-in cylinders, 5 ft 3-in driving wheels, 175 lb per sq in pressure, and a total weight in working order of 48¾ tons, without tender. The “J.39” type of the LNER may be looked upon as a counterpart, rather larger and more powerful, with 20-in by 26-in cylinders, 5 ft 2-in driving wheels, a working pressure of 180 lb per sq in, and a weight in working order of 57¾ tons. Both these classes are used at times on slow passenger and excursion work. 0-6-0 tender engines since the grouping, placing reliance on earlier 0-6-0 types for its slow freight services, and, as with the Great Western, on 2-6-0’s and 4-6-0’s for those operated at high speeds. FOR WORKING LONG-DISTANCE FREIGHT TRAFFIC AT SPEED, a powerful 2-8-0 Great Western Railway engine. This locomotive - one of nine of its class - has driving wheels of 5 ft 8-in diameter. Boiler pressure is 225 lb per sq in, cylinders measure 19-in by 30-in, and the engine weighs 82 tons in working order, and 122 tons with tender. For the working of heavy freight and mineral traffic, as previously mentioned, the 0-8-0 and 2-8-0 (“Consolidation”) types hold the field. The most outstanding 2-8-0 class in Great Britain is that built a good many years ago by the Great Western Railway for working long-distance freight traffic at speed. These engines, of which only nine - Nos. 4700 to 4708 - were constructed, have wheels with the large diameter - for eight wheels coupled - of 5 ft 8-in. A special boiler, larger than that of the 4-6-0 engines which had been built up to that time, was designed for this group, working at 225 lb per sq in. These powerful locomotives work some of the important night services, such as the 10.30 pm from Greenford to the Birkenhead direction, which is booked to cover the 145.3 miles to Coton Hill, Shrewsbury, without a stop in 225 minutes, at an average speed of 38.8 miles an hour. These 2-8-0’s each weigh 82 tons in running trim, and have 19-in by 30-in cylinders, and 225 lb pressure. The standard Great Western 2-8-0’s have recently been matched by a new standard 2-8-0 type on the LMS; both carry 225 lb per sq in working pressure, and, of course, the taper boilers which are now standard on both lines. The Great Western type has 18½-in by 30-in cylinders and 4 ft 7½-in driving wheels, and the LMS type 4 ft 8½-in wheels and 18½-in by 28-in cylinders. The LNER also owns an extensive 2-8-0 class, with three cylinders 18½-in in diameter by 26 in stroke, 180 lb per sq in pressure, 4 ft 8-in driving wheels, and a weight in running order of 78¾ tons. As compared with this, the LMS “Consolidations” weigh 70½ tons apiece, and those of the GWR 75½ tons. Of 0-8-0 locomotives the LMS is the principal user. Hundreds of this wheel arrangement were built before the grouping by the late London and North Western Railway, many more by the Lancashire and Yorkshire Railway (which built the biggest and heaviest 0-8-0’s in Britain), and a few by the Caledonian Railway. After the grouping a new and handsome standard design was turned out, with 19-in by 26-in cylinders, 200 lb per sq in working pressure, 4 ft 8½-in driving wheels, and a weight in running order of 60¾ tons; a large number of this type also has been built. LMS “MOGUL” MIXED TRAFFIC ENGINE. This locomotive has cylinders 21-in by 26-in. The diameter of the six-coupled wheels is 5 ft 6-in, the total heating surface is 1,828 sq ft, and the grate area 27½ sq ft. Boiler pressure is 180 lb, and the weight of the engine in working order is 65½ tons. The tender weighs 42 tons 4 cwt, and holds 5 tons of coal and 3,500 gallons of water. Before leaving the matter of eight-coupled freight engines, it is not without interest to recall that the only eight-coupled locomotives ever built by the Midland Railway were not for its own use, but for that of the Somerset and Dorset Joint Railway, of which it was part owner. This line has to work coal from the Somersetshire coalfield over 1 in 50 grades through the Mendip Hills. These 2-8-0 engines also form a part of the locomotive stock of the LMS, which is now responsible for providing all locomotive power on the Somerset and Dorset. Widely used as are ten-coupled tender locomotives for freight service in other countries, none have been built for British use, other than the solitary Midland example - now No. 2290 of the LMS - which was a four-cylinder locomotive designed expressly for banking trains up the 1 in 37.7 grade of the Lickey incline in Worcestershire. But no further examples were built. No. 2290 has four 16¾ by 28-in cylinders, 4 ft 7½-in driving wheels, a working pressure of 180 lb per sq in, and a weight in running order of 73¾ tons. FOR FAST GOODS or excursion traffic, a six-coupled superheater LNER locomotive. The cylinders measure 20-in by 26-in and the coupled wheels have a 5 ft 2-in diameter. The overall length of engine and tender is 54 ft. Boiler pressure in 180 lb per sq in, and the tractive effort 25,664 lb. This class of 0-6-0 locomotives is known as the “J.39”. In turning to tank locomotives, we find a considerably greater variety. No other among the world’s most important countries uses the tank engine to the same extent as Great Britain. In theory, the advantage of the tank over the tender engine for runs of moderate length is that with the former power is not wasted in hauling about a heavy tender with greater supplies of coal and water than the engine normally requires. But just as in British main line working the tendency is to equip the locomotives with tenders of progressively increasing size - the striking new standard tenders of the LMS with their high curved sides offer a good example of this development - so the tank engine tends to go out of favour for intermediate main line work. Alternatively, its bunker accommodation is enlarged, to increase the length of time during which the locomotive is able to keep at work without having to repair to the coal stage for replenishment of the coal supply. A specific example of this type of alteration is seen in the 2-8-0 freight tank engines of the Great Western Railway, uniform in general dimensions with the 2-8-0 tender locomotives, but designed as tanks to provide economical haulage of coal trains up and down the short but steeply-graded valleys of the South Wales coalfield. Thirty of these locomotives have been rebuilt as 2-8-2’s and their bunker capacity has thus been increased from 4 tons to 6 tons; the weight of the engine in running order has similarly gone up from 82 to 92¾ tons. It is because of this desirability of increasing bunker capacity that there has been a tendency in recent years to reverse the wheel arrangements of the bigger main-line tank designs. Thus the 4-6-2 wheel arrangement, which was at one time popular in Great Britain, on the London and North Western and Great Central Railways in particular, is no longer built. In modern tank designs it tends to give place to the 2-6-4 type with the bogie at the rear end supporting a bunker of ample size. THREE-CYLINDER 2-6-4 LMS LOCOMOTIVE of the type used for working the London suburban services. The photograph shows the totally enclosed cab for the protection of the enginemen during bad weather. 5 ft 9-in diameter, and they have three cylinders 16-in diameter by 26-in stroke, and 200 lb per sq in pressure. They weigh 92½ tons in working order. Engines of this type have almost entirely replaced the 4-4-2 tanks of the late London Tilbury and Southend Railway, now part of the LMS. This section works a busy service of residential express trains along the north bank of the Thames between Fenchurch Street Terminus and Leigh, Westcliff, Southend-on-Sea, and Shoeburyness, as well as the important boat services to and from the port of Tilbury. Elsewhere on the LMS these locomotives are responsible for some of the most lengthy runs ever entrusted to tank engines, as, for example, from Preston to Whitehaven and back, a daily round trip of 203 miles. Some fine 2-6-4 tanks, known as the “River” class, were built in 1917 by the South Eastern and Chatham Railway (later absorbed in the Southern Railway) for the services between London and the coast, and in particular to and from Folkestone and Dover. They had 19-in by 28-in cylinders, 6 ft driving wheels, a working pressure of 200 lb per sq in, and a weight of 82½ tons in running trim. Unfortunately one of these locomotives was involved in a derailment at high speed in 1927. Although subsequent experiments - including the running of one of these engines light at 83 mph round the reverse curves of the LNER at Offord, between St. Neot’s and Huntingdon - proved that the track was probably at fault rather than the design of the locomotive, the decision was reached to convert the whole series to 2-6-0 tender locomotives. In any event, however, because of the rapid extension of long-distance electrification on the Southern Railway, the same decision would probably have been reached later on, as these engines would have had little suitable work left them to do. It is for this latter reason that another famous tank class of recent years has been converted to a tender design. In 1914 and subsequently, the London, Brighton and South Coast Railway built a series of seven large and powerful 4-6-4 tank locomotives chiefly for the Victoria-Brighton sixty-minutes workings. These engines were express locomotives in every detail but the provision of separate tenders, as they were provided with driving wheels of 6 ft 9-in diameter. Not only so, but their outside cylinders, 22-in diameter by 28-in stroke, were the largest ever fitted to a British locomotive. Their working pressure was 200 lb per sq in, and the weight in running trim 98 tons. STANDARD 0-6-0 FREIGHT ENGINE in use on the LMS. There are many hundreds of this type in operation. Cylinders measure 20-in by 26-in, and the coupled wheels have a diameter of 5 ft 3-in. The total heating surface is 1,472 sq ft, grate area is 21¾ sq ft, and boiler pressure 175 lb per sq in. The engine weighs 49 tons and the tender 41 tons. But the completion of the main-line electrification to Brighton and Eastbourne deprived them of suitable occupation on the Central Section of the Southern Railway, and they have therefore been rebuilt as tender locomotives of the 4-6-0 type and transferred to the Western Section, thus closing a notable chapter of “Brighton” history. The contrast between these big “Baltics” and the diminutive “Terrier” 0-6-0 tanks of former Brighton days - 98 tons as compared with 27 tons - was about the most extreme that could be imagined. “BALTIC” TYPE LOCOMOTIVE formerly used on the Central Section of the Southern Railway. This engine had outside cylinders measuring 22-in by 28-in, the largest yet used in Great Britain. Locomotives of this type have since been converted to 4-6-0’s with tenders. 4-6-4’s, built in 1924, were a four-cylinder tank development of the large 4-6-0 tender engines that had been built at Horwich, and were uniform in dimensions generally with the type last mentioned. They had 6 ft 3-in driving wheels, four cylinders 16½-in by 26-in, a weight in working order of 99¾ tons, and a working pressure of 180 lb per sq in. The Glasgow and South Western series, built in 1922, had two cylinders 22-in by 26-in, 6 ft driving wheels, 180 lb pressure, and weighed 99 tons in running trim. The Furness Railway 4-6-4 tanks appeared a year earlier and were not quite so large or powerful as the foregoing. With 5 ft 8-in driving wheels, 19½-in by 26-in cylinders, and 170 lb pressure, they weighed 93¼ tons in running order. But for reasons previously explained, express passenger tank engines of such large and powerful descriptions as these are not generally favoured to-day, particularly because of their limited accommodation for coal and water. For this reason all these three varieties of the 4-6-4 tank on the LMS are now regarded as obsolescent, some having already been scrapped. A “JUNIOR KING ARTHUR”. Southern Railway engines of this type are similar to the famous “King Arthur” class, except that the driving wheels have a diameter of 5 ft 7-in instead of 6 ft 7-in. They are used for both fast freight and passenger work. What may well claim to be the most remarkable tank locomotive ever built in Great Britain was one built in 1902 for the Great Eastern Railway to the designs of Mr. James Holden, who was at that time the Locomotive Superintendent of the company. The Great Eastern, which had lost a good deal of its station-to-station traffic in the London suburban area at that time because of the competition of newly-electrified municipal tramways, was being threatened with the still more serious competition of an electric tube railway to North-East London, at a period when tubes were in their infancy. Mr. Holden was therefore commissioned by his directors to produce a suburban locomotive which would give an acceleration from rest equal to that of electric traction. The “Decapod”, as it was called from the ten-coupled wheels on which it was carried, was the outcome. It was the first locomotive ever built in Great Britain to have ten wheels coupled. Moreover, apart from early experiments in 1846 and 1868, it was the first locomotive to be built for a British railway with propulsion by three high-pressure cylinders, in the fashion which has since become so popular on three out of four British groups. In many ways, indeed, this locomotive, numbered 20 in the GER books, was a unique machine. A boiler 5 ft 3-in in diameter was provided, with a wide firebox spread across the frames in the manner which later became familiar on the Great Northern “Atlantics”. This firebox had a grate area of 42 sq ft - more than that of one of the LNER “Pacifics” - and the boiler, which carried a working pressure of 200 lb per sq in, had a total heating surface of 3,010 sq ft. The three cylinders were each 18½-in in diameter by 26-n stroke; the outside cylinders drove the third pair of wheels, and the inside cylinder the second pair, by means of a forked connecting rod which completely enclosed the leading coupled axle. To keep the weight within limits, the engine had no side tanks, but space was found for 1,300 gallons of water in tanks carried between the frames in front of the firebox, and under the coal bunker. Two sets of safety valves were provided, one over the firebox, and another over the rear ring of the barrel. Another novelty was the automatic sanding gear, which came into operation automatically with the opening of the regulator, and applied sand by compressed air to four of the wheels. For the purpose of testing the acceleration of the locomotive, a special timing plant was laid down near Chadwell Heath, and here a series of trials was carried out. The “Decapod” was completely successful. The aim was to attain thirty miles an hour in thirty seconds from the dead start, with a load of 300 tons. In the event a train of eighteen four-wheeled coaches was made up, weighing in all 335 tons. Despite a strong side-wind, No. 20 beat the desired acceleration of 1.40 ft per second per second of acceleration from rest, thus attaining thirty miles per hour in a shade under thirty seconds from the dead start, and with a train of over the specified weight. In consequence the GER was able, successfully, to oppose the Bill for the tube, which was defeated in Parliament, and to show that when the demand rose the Great Eastern would be equal to the occasion. THE “DECAPOD” was the first locomotive in Great Britain to have ten-coupled wheels. Built in 1902 for the Great Eastern Railway, it had a working pressure of 200 lb per sq in and three cylinders 18½-in by 26-in, and weighed 80 tons. For reasons described in this chapter, the engine was converted in 1906 to a 0-8-0 tender freight locomotive. At that time there was a certain falling off in suburban traffic. As the 80 tons weight of the “Decapod”, concentrated on a wheelbase only 19 ft 8-in in length, would have necessitated a good deal of costly bridge-strengthening work in the suburban area had a class of such locomotives been built, another use had to be found for No. 20. In 1906, therefore, it was converted to a tender freight locomotive with the 0-8-0 wheel arrangement - the only eight-coupled engine that the Great Eastern ever possessed - and after a comparatively short life was scrapped. Nevertheless the “Decapod” was a locomotive experiment of a notable description, which created enormous interest at the time; and as a political move it served to the full the purpose of its construction. It offers vet another illustration of the way in which steam, which is regarded in so many quarters as an obsolescent force in railway operation, can rise to the occasion when challenged by any other prime mover. Another tank locomotive type which never performed the service for which it was designed was the 4-6-4 class designed by Mr. R. H. Whitelegg for the London, Tilbury and Southend Railway shortly before that company was acquired by the Midland. Access to the London terminus used by the LTSR trains - Fenchurch Street - was over a long viaduct owned by the Great Eastern Railway, to whom also Fenchurch Street Station belonged. Unfortunately certain bridges on this route, notably the great skew bridge at Stepney, had not been designed to carry engines of such weight. The Tilbury 4-6-4 tanks could, therefore, work only east of Barking, and the smaller 4-4-2 tanks had to continue to haul the heavy Fenchurch Street-Southend trains. Since then, of course, the Midland has been absorbed by the LMS and the Great Eastern by the LNER; Fenchurch Street has been rebuilt and the viaduct approach has been strengthened ; so that now, as previously mentioned, the new Stanier three-cylinder 2-6-4 tanks have been drafted to this service. Little need be said of other tank locomotive classes. As set out in the chapter entitled “Locomotive Types”, beginning on page 939 of this work, tank engines are of widely varied wheel arrangements, according to the particular service for which they are intended - suburban passenger, short-distance freight and mineral, marshalling yard work, or ordinary shunting. Reference may be made also to the chapter “Tank Engines”, beginning on page 481. 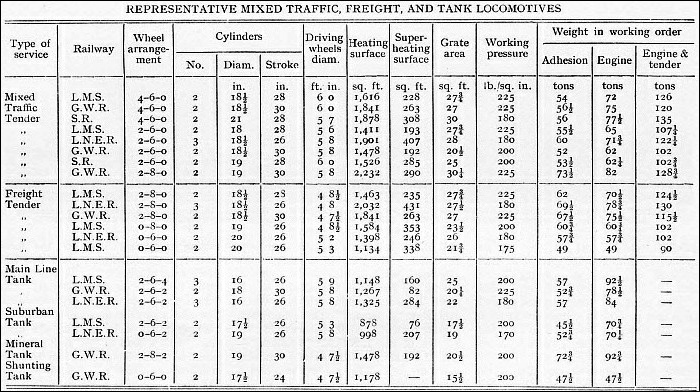 The table on this page gives the leading dimensions of representative mixed traffic, heavy and ordinary freight, and tank locomotive types used in Great Britain of what may be regarded as standard classes. “CONSOLIDATION” TYPE of locomotive on the LNER. This 2-8-0 has three cylinders 18½-in by 26-in, and driving wheels 4 ft 8-in in diameter. The total heating surface is 2,463 sq ft, and the grate area 27½ sq ft. Boiler pressure is 180 lb and weight (engine alone) 78¾ tons in working order. You can read more on “British Express Locomotives”, “A Famous Locomotive Type” and “Tank Engines” on this website.